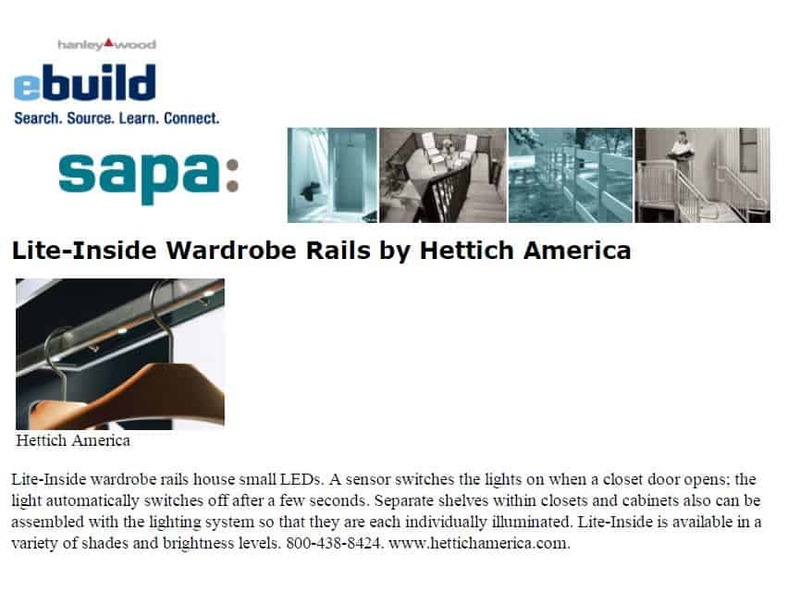 Hettich America L.P. is a leading supplier of quality furniture hardware products and programs with innovative features and value added benefits. As part of Hettich International, Hettich America offers its customers the experience of one of the world’s largest manufacturers of functional hardware. Hettich is known worldwide for guaranteed reliability, advanced design and exacting standards. We worked for the American division of this German company for a decade supporting them through a strategic public relations program which included advertorials, press conferences, press kits, new product announcements, market research and trade show public relations. KBIS – The Kitchen & Bath Industry Show is always the perfect venue for industry trends and press conferences in the booth. In 2001 we promoted Concept 2010, a concept for the kitchen of the future, and a new ProDecor Catalog. Compact, mobile, ergonomically correct and efficient – the kitchen of the future was predicted to be drastically different and focus on time savings. In the Concept 2010 vision, the kitchen assumes the role of a logistically functional unit. Built-in elements arranged side-by-side are abandoned, creating a unit that can be integrated into any home environment. The Concept 2010 kitchen takes into account four main areas to work for – natural environment, ergonomics, convenience and flexible living space. Hettich’s popular ProDecor collection of decorative fittings and its expanded catalog offer perfect solutions for various lifestyles. Featuring 2,000 decorative fittings ranging from drawer and door handles and knobs, to pocket handles and hat and clothes pegs, reporters loved these solutions. Interzum – In April 2005, Hettich celebrated its 75th anniversary in Cologne, Germany. The celebration took place during Interzum, the world’s leading trade fair for furniture production and interior design. We invited and hosted media from the U.S. and Canada at this festive event with the theme: 75 years ….. At home in all good furniture. The event was a great opportunity to reflect on the past and to thank the partners who helped to establish Hettich as an international supplier and service partner for the furniture industry. NeoCon – This show is at the forefront of changing commercial design and business trends. Hettich showcased products for the office furniture interior fittings market at this show demonstrating how versatile the product line is from cabinets to office furniture. Hettich launched the Org@Wall at NeoCon in 2002. This trendy new wall system reflects the trend of modern office design. 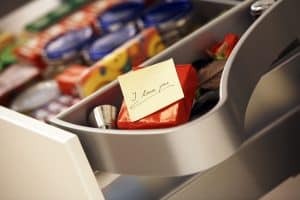 Combined with the Org@Tower vertical drawer, the new organizational element completes an Org@System geared to the practical needs of today’s office worker. IWF – The International Woodworking Fair & Show is always a staple of the woodworking industry. This show is attended by top decision makers, CEOs, CFOs, Presidents, Vice Presidents, hardware buyers and suppliers, and independent cabinet manufacturers. For this show, we focused on meeting with as many members of the press as possible. Typically, a booth tour for the press would focus on Hettich’s growth, business, new distributors and a tour of the show booth. The 2008 show was a huge success garnering tours and coverage from Woodworking, CabinetMaker, Custom Woodworking Business, Wood & Wood Products, Furniture Design Manufacturing, Surface & Panel, Material + Technik Mobel, Wood Industry, Woodshop News, Kitchen and Bath Business, Wood Digest, Finishing, Surface Fabrication and Renovation Bricolage. Hettich manufactures a wide variety of functional hardware used in woodworking, furniture, office furniture, kitchen cabinetry, vehicles and many other applications. 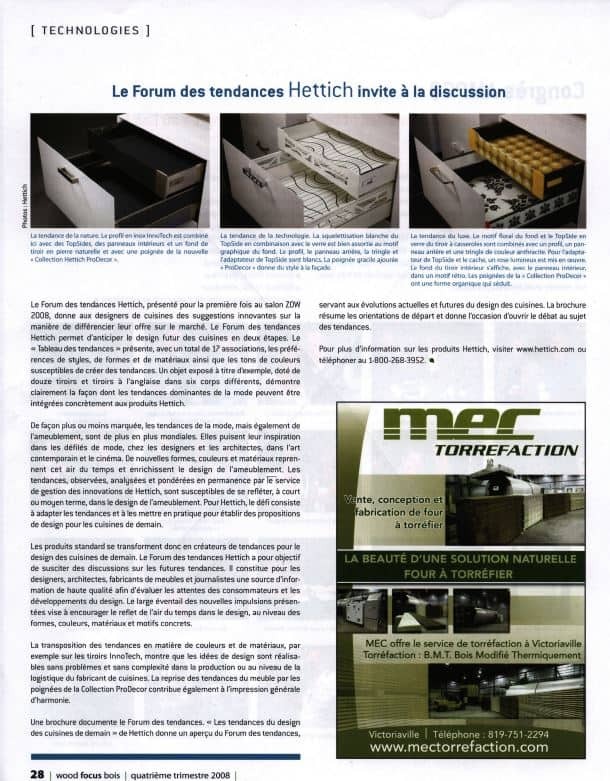 From the popular Quadro drawer slides to Pro Décor decorative handles and knobs, to the InnoTech drawer system, promoting Hettich’s products to the media was always fun and always resulted in media placements. When you are ready to take your business-to-business marketing to the next level, contact Denim Marketing. We can provide media relations, trade show public relations, press conference planning, customer surveys, case studies and more.